One of a few attempts to recreate various absinthe recipes on the different scales of quality found in old distillers manuals. 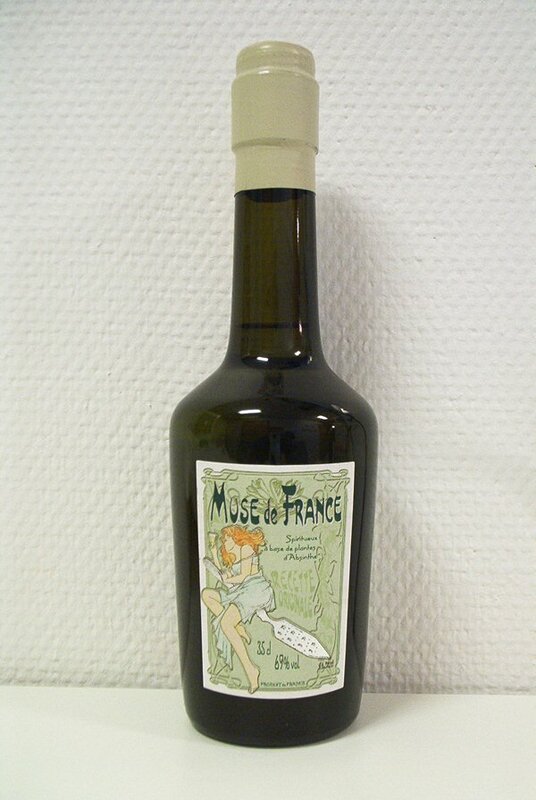 Muse de France is a product manufactured at the Lemercier Distillery in Fougerolles, France. It is not a product of Lemercier, but from Frenchman Phil. This is variation number 1 of two available at the time this is written. The two are test runs in order to get feedback on results and to make a good final product. This review is for recipe number 1. Recipe number one is called an absinthe "Ordinaire" by Frenchman Phil. I can understand that. It is nothing out of the ordinary. It's not bad, but not all good. The #1 is made using more wormwood and less anise and fennel, thus making it more bitter. The taste at first is quite alright, but it swiftly turns into a rather bitter finish. Using sugar takes away the worst edge of that and it does become drinkable, but nothing I'd drink regularly. The #1 is however a good contrast to the more common absinthe found in the #2, and gives a view of what different amounts of certain ingredients does to the taste and aroma. Overall I'd say that it's a decent drink, but too bitter for my taste.